The last two weeks has seen extreme weather conditions for us in my local area in Australia. In the last 14 days, 7 days have been 40 degrees celsius or higher (104 F +) and of the other 7 days only one was below 37 degrees C (99 F). To make things worse, the nights will not cool down, with most nights remaining over 20 degrees C (68 F) and a couple of nights being 26 + degrees C (79 F). On more than one occasion I have checked temperatures between midnight and 3 am and it has been 30 degrees or more in the middle of the night! It is HOT!!! My horses are crusted in salt from continuous sweating. I took pity on them today and instead of having them out grazing with muzzles on they have hay in their hay pillows so they can at least stay in the shade. But back to salt. I normally just let my horses eat salt free choice. Their balancer pellet gives them about 5 grams of salt per day and the rest of what they need they eat as loose rock salt. BUT, the last couple of weeks I have been adding it to their feeds so I know they are getting enough to keep sweating. If horses run low on sodium or chloride they can’t sweat, and that, in these conditions is life-threateningly dangerous. There is a trend at the moment though for people to add large amounts of salt to their horse’s daily feeds, despite actual requirements or what may be coming from the rest of their diet. Blanket recommendations like ‘add 10 grams of salt per 100 kg of bodyweight’ seem to be commonplace, yet don’t seem to take into account a horse’s specific situation. Take Poet’s diet for example, shown in the graph below. If I add 10 g/100 kg of BW to his diet his sodium intake is well over 200% of what he needs. In these extreme conditions this may well be accurate, but once it cools off a little this is way more sodium than he needs. While I was out just now giving them hay I had the thought ‘I wonder what this excessive salt might be doing to the bacteria in their gut’?? 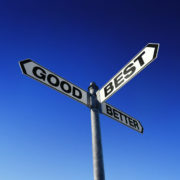 Salt is, after all one of the best known and most widely used anti-bacterial agents in the world. So I did a little research… and while not much came up, there is a recent paper, published in ‘Nature’ (i.e. one of the most reputable journals in the world, so we can trust it) showing that in both mice and men adding more salt than normal to a diet affected the gut bacterial populations, in some cases it entirely wiped out certain strains of bacteria! Eek! What is really interesting (from a human perspective) is that the researchers were then able to link those shifts in gut bacteria to high blood pressure, which may help to explain (the as yet poorly understood) link between high salt diets and hypertension. Back to your horses though… feeding excessive salt is unlikely to have any benefit and may be negatively affecting the good bacteria in your horse’s gut. 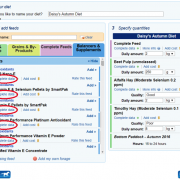 So when using FeedXL, just meet your horse’s requirement for sodium with salt that is added to the diet. Then leave free choice salt (preferably as easy to eat loose rock salt) out so they can top up any extra requirement they may have. Iron is essential for the production of red blood cells. According to the 2007 Horse NRC, Fe requirements are 50 ppm for growing foals, lactating and pregnant mares, and 40 ppm for all other classes of horses. The 2005 NRC suggested a maximum tolerable Fe concentration of 500 ppm using data from other species. It is claimed that excess dietary Fe is causative of horses becoming insulin resistant. Athletic horses, and particularly those in Thoroughbred racing, are often supplemented with Fe in an attempt to improve performance. Supplementation is commonly carried out without any formal analysis of the diet to determine if additional iron is required. Forages are typically high in iron and supply a majority of iron in all equine diets. This study looks at the iron concentration in forages typically fed to equines and whether iron from forage is enough to meet the iron requirement of an athletic horse. Nutrient concentrations from hay samples submitted for analysis in 2017 and for which Fe was measured were obtained from Equi-Analytical, representing 3,060 grass, 1,193 legume, and 1,584 mixed hay samples. Iron concentration was measured using inductively-coupled plasma mass spectrometry (ICP). Analysis methodology is available from dairyone.com. Statistical analysis was performed using Proc MEANS of SAS. Iron was highest in Legume and Mixed Mainly Legume Hays and lowest in Grass Hay (Table 1). All hay types had a mean iron concentration more than five times that required by athletic horses and a median iron concentration more than three times. From all hay samples (n = 5,837), 707 contained Fe at or above the suggested tolerable threshold of 500 ppm, while only 81 contained Fe at less than 50 ppm. Further, only 15 contained Fe at less than 40 ppm. A 500 kg horse in heavy work has an iron requirement of 500 mg/day (NRC 2007; based on a daily feed intake of 2.5% bodyweight and a requirement of 40 ppm). Forage intake is often restricted by Thoroughbred trainers. But even when fed at 1% of bodyweight to a 500 kg horse, these hays will supply an average 1,060 mg to 2,230 mg of iron per day, supplying more than 200% of daily iron requirements in the forage component of the diet alone. Fortified grain concentrates are fed at an average 2.5 kg/horse per day in Australian Thoroughbred racing stables (Richards 2003). 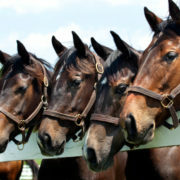 These concentrates have an average iron concentration of 190 ppm (FeedXL.com), adding an additional 475 mg/day of iron to the diet of these horses. Almost 60% of Australian Thoroughbred trainers then add an iron supplement to their horses’ diets (Richards 2003). It is expected similar trends would be found in the USA. Given the dearth of Thoroughbred racehorses that are insulin resistant, despite Fe supplementation in combination with diets that can easily supply amounts beyond requirements, it seems unlikely excess Fe causes insulin resistance. However, it is recognized insulin resistant horses may have elevated serum ferritin. Council NR. Nutrient Requirements of Horses: Sixth Revised Edition. Washington, DC: The National Academies Press, 2007. Richards N, Hinch G, Rowe J. The effect of current grain feeding practices on hindgut starch fermentation and acidosis in the Australian racing Thoroughbred. Aust Vet J 2006;84:402-407. 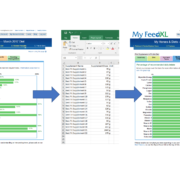 FeedXL Nutrition Software, https://feedxl.com/, 2018. 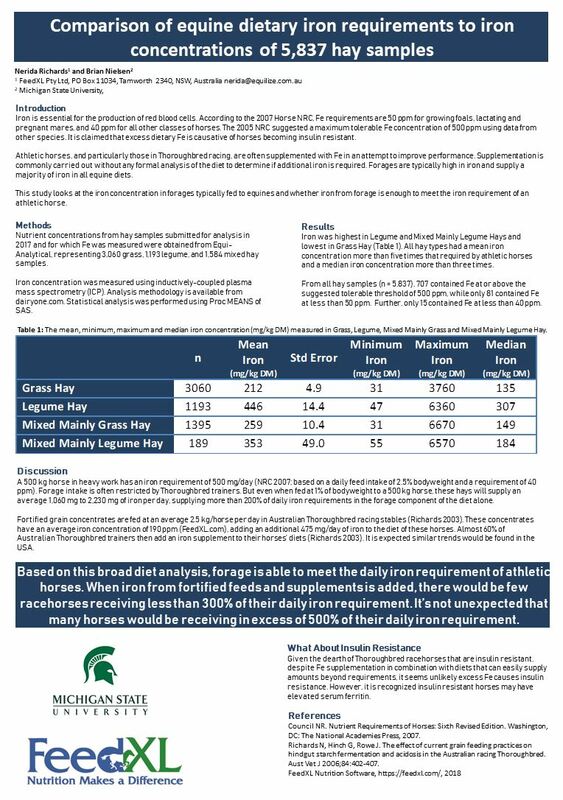 HUGE THANKS to Equi-Analytical for providing the data to write this paper, which was presented as a poster at the recent International Conference on Equine Exercise Physiology (ICEEP). https://feedxl.com/wp-content/uploads/2019/02/AdobeStock_175427520.jpeg 3648 5472 Dr Nerida Richards https://feedxl.com/wp-content/uploads/2017/08/FeedXL-header-logo-300W.png Dr Nerida Richards2019-01-21 10:07:182019-02-06 10:40:46Iron for Horses: Could Forage Be Enough? Did you know Vitamin C is not an essential nutrient in your horse’s diet? Unlike we humans, who will get scurvy and die if we don’t eat vitamin C, horses make their own vitamin C in their liver! Clever right!! There are some situations, like when a horse is very ill, really stressed or has liver damage where supplementing with vitamin C may be useful. Just be mindful that when you want to stop supplementing you should remove the vitamin C from the diet gradually so the horse has a chance to ramp its own production up again. https://feedxl.com/wp-content/uploads/2018/10/shutterstock_153831563.jpg 663 1000 Dr Nerida Richards https://feedxl.com/wp-content/uploads/2017/08/FeedXL-header-logo-300W.png Dr Nerida Richards2018-10-09 07:25:012019-02-15 09:27:22Vitamin C for Horses? Diet Lacking in Vitamin E? We are frequently asked about how to add Vitamin E to a horse’s diet when all other nutrient requirements are being met. Vitamin E is abundant in fresh green forages and many horses will meet their daily requirement of Vitamin E with adequate intake of good quality pasture. Vitamin E declines over time in stored feeds including preserved forages. Most commercial pre-mix feeds and vitamin & mineral supplements account for this and are formulated with supplementary Vitamin E.
At times when pasture is average or poor quality, overgrazed or simply not available, diets which previously had adequate Vitamin E may become low as a result. Sometimes even with a good quality pre-mix feed or vitamin & mineral supplement, the Vitamin E levels may still not be adequate within the diet. Additional vitamin E can be safely added to diets and can be found in FeedXL’s blue ‘Balancers & Supplements’ tab under ‘Antioxidants’. Antioxidant supplements commonly contain both selenium and vitamin E. Unless the diet requires additional selenium, look for supplements which contribute only vitamin E to your horse’s diet. To find vitamin E only supplements, click on ‘Complete Data’ which is located below the ingredient name when editing diets or browsing ingredients and FeedXL will show you which nutrients that product contains. (See the image in this post). 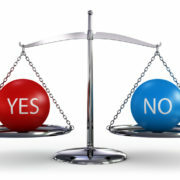 Another consideration when choosing a suitable Vitamin E supplement is the form of Vitamin E to supplement with. Natural vitamin E is reported to be more effective in raising plasma Vitamin E concentrations when compared with a synthetic source. To know which is which you will need to read the manufacturer supplied information for each product on their website or product labels. https://feedxl.com/wp-content/uploads/2018/10/Vitamin-E.png 678 941 Dr Nerida Richards https://feedxl.com/wp-content/uploads/2017/08/FeedXL-header-logo-300W.png Dr Nerida Richards2018-07-02 07:28:292019-02-15 09:41:43Diet Lacking in Vitamin E? This little vitamin is not talked about much in equine nutrition, mainly because we still don’t know exactly what a horse’s dietary requirement is. We also assume a large part of their requirement is fulfilled by the Vitamin B6 produced by the bacteria in their hindgut. I know a rabbit is very different animal to a horse, but from a gut physiology and nutrition perspective they are actually really similar, so I thought I would take a look to see what the researchers found. Vitamin B6 supplementation was shown to significantly alter protein metabolism and increase the ratio of fore + hindleg muscle weight to body weight (i.e. supplemented rabbits had more leg muscle). Interesting! We do track B6 intake in our Pro FeedXL plans … this just reinforces to me though how important a horse’s base diet is when it comes to achieving specific outcomes. For example, if you are wanting your horse to build muscle but you aren’t meeting basic nutrient requirements (like vitamin B6) you could add all the fancy muscle building supplements you like to the diet and they won’t help! You can’t build muscle unless you get your basics right first! Here at FeedXL, we can help you with that! Take a look at our plans and pricing here. Find Supplements to Fix This Diet – It’s Here!! In its current state it is suggesting some very neat and useful diets, BUT it is pretty ugly, doesn’t do any sort of decimal place rounding, presents options to you in a boring spreadsheet format and can’t fix or provide options for all diets … think of it as seeing someone first thing in the morning right out of bed. Mostly functional but not so pretty to look at! Have fun… and we take no responsibility for the possible addictive nature of this new feature!! https://feedxl.com/wp-content/uploads/2017/05/Screen-Shot-2018-01-09-at-1.27.43-PM-e1515475743178.png 499 1000 Dr Nerida Richards https://feedxl.com/wp-content/uploads/2017/08/FeedXL-header-logo-300W.png Dr Nerida Richards2017-05-06 11:35:492019-02-16 08:03:31Find Supplements to Fix This Diet - It's Here!! 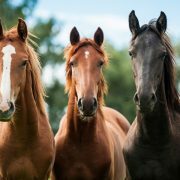 Chickpeas For Horses: Should They Be Cooked First? 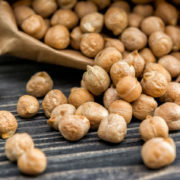 Chickpeas do contain anti-nutritional factors including trypsin inhibitor, which is the same as the main anti-nutritional factor found in soybeans. Trypsin inhibitor does exactly as its name suggests, it inhibits/stops trypsin, an enzyme in the small intestine which chops up protein into smaller pieces so it can be absorbed. Too much trypsin inhibitor in the gut can reduce protein digestion to such an extent that protein deficiency will become apparent. This doesn’t sound good for chickpeas! BUT, on reading about the amount of trypsin inhibitor in chickpeas it is much, much lower than soybean. I can find published values of 15 TUI (Trypsin Units Inhibited – reflects quantity of trypsin that has its activity inhibited) for chickpeas while values for soybean are more like 80 TUI. Reading papers and interpreting units is proving exceedingly difficult as it seems everyone likes to express their TUI units in slightly different ways so just be careful with this! Chickpeas have been fed raw to pigs at levels of up to 88% without affecting measured parameters to determine growth and feed conversion. A pretty good indication the anti-nutritional factors aren’t too anti-nutritional as growing pigs will show us very quickly if something is not right. This study did however find that adding additional methionine improved growth performance in chickpeas. Chickpeas are routinely used uncooked in pig diets in Australia at levels up to 20% of the diet without any ill effect. They typically aren’t fed to younger pigs less than 20 kg bodyweight. Chickpeas are classified as a pulse, which is a seed from a leguminous plant. Chickpeas are rarely included in horse diets but can be fed as a protein and energy supplement in much the same way lupins or faba beans are used. The protein is of moderate to good quality with good concentrations of the essential amino acid lysine. They may however be too low in methionine for some classes of horses. Like most pulses, chickpeas appear to contain some anti-nutritional factors including a trypsin inhibitor, which blocks the activity of the protein digesting trypsin enzyme in the gut and can negatively affect protein digestion. The anti-trypsin activity of chickpeas is however much lower than that of soybean, with chickpeas expected to ‘block’ around 15% of trypsin enzyme activity in the gut compared to more than 80% of trypsin activity being blocked when raw soybean is fed. Chickpeas should therefore be safe to feed without any form of heat treatment to mature horses at levels of no more than 20% of their ‘hard feed’. If larger amounts were to be fed, heat treatment is recommended. Chickpeas would be best heat treated prior to feeding if being fed to horses younger than 12 months of age. As always our information is quite conservative, but we prefer to play it safe with so many people using our service with so many varied scenarios. I hope that helps everyone who has had a recent interest in the use of chickpeas in horse rations. https://feedxl.com/wp-content/uploads/2017/03/Chickpeas.jpg 483 724 Dr Nerida Richards https://feedxl.com/wp-content/uploads/2017/08/FeedXL-header-logo-300W.png Dr Nerida Richards2017-03-16 11:34:262019-03-02 06:29:06Chickpeas For Horses: Should They Be Cooked First? Joint Supplements: Are They Beneficial? Joint supplements! A lot of you use them, and while there is theoretical justification for their use there is still very little science that actual shows a proven benefit in feeding them. A study just published does however lend some nice information in this area. It is both blinded (i.e. the people feeding the horses, the people assessing the horses for various measures of movement and levels of comfort don’t know if the horses was on the joint treatment or not at the time of assessment so it couldn’t influence what they ‘saw’ and recorded. And the author who analyzed the data was blind to which horse was on what treatment so they too could not be influenced) and is also a crossover study where each horse in the study was on both the joint treatment and the placebo and assessed on both so you could see changes in the same horse as opposed to changes between two different groups of horses where one group is treated and one group given a placebo. This study also used ‘objective’ measurements of gait using high speed motion capture to assess movement of the hind legs at the trot. The results are interesting, with significant improvements in lameness scores (less lameness in treated horses), less response to flexion tests and improvements in muscle tone reported (plus many other results). The full paper is available here for full download for the next week or so (http://www.sciencedirect.com/…/article/pii/S0737080616304749) for those of you interested in reading it. A good time to remember too that not all joint supplements are created equally as far as the ingredients and amount of ingredient per dose they contain. The supplement used in this study was ‘FlexAbility’, from Science Supplements, UK; it contains chondroitin sulfate 162 g/kg, glucosamine 190 g/kg, vitamin C 80 g/kg, methyl sulfonyl methane 256 g/kg, docosahexaenoic acid 66 g/kg, eicosapentaenoic acid 34 g/kg For those of you who use FeedXL, if you look in the ‘Health’ tab in your results you will see a breadown there of the various joint nutrients and how much of each are in your horse’s diet when you use a joint supplement. https://feedxl.com/wp-content/uploads/2017/02/iStock-187310487.jpg 2530 3935 Dr Nerida Richards https://feedxl.com/wp-content/uploads/2017/08/FeedXL-header-logo-300W.png Dr Nerida Richards2017-02-15 11:37:082019-03-02 06:29:28Joint Supplements: Are They Beneficial? Oil for Horses: Good or Bad? 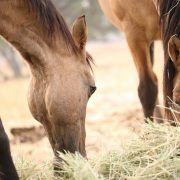 Hard working horses have enormous requirements for energy that are traditionally filled using high grain rations fed together with chaff and hay. However, feeding large amounts of grain does come with its own set of issues which can include colic, hindgut acidosis, nervous or fiery behaviour, tying up and loss of appetite. Oil has gained popularity in recent years as a substitute source of energy for working horses, but is it effective, how much can be fed, are all oils equal in the benefits they can provide and do they cause any health issues of their own? The biggest benefit oils provide working horses is their very high energy content relative to grains. Oils contain nearly 3 times more energy than oats, with 400 mls of vegetable oil providing as much energy as 1 kg of oats. The real benefit in this is you can reduce the size and sheer bulk of feed a horse has to consume without reducing calorie intake, allowing you to get enough ‘feed’ into horses with poor appetites. The end result being these horses can hold their weight and continue to train and compete for longer than they otherwise would on a more traditional diet. Oils generate less heat during the digestive and metabolic processes than an equivalent amount of grain or forage. Feeding oil also means that you can feed less grain and still meet energy requirements. Combined, this means that high oil diets place less of a heat load on working horses, reducing electrolyte losses and the amount they need to sweat to stay cool, a big bonus for hard working horses, especially those training and racing in hot environments or working over very long distances. Fatty acids from oils are the preferred fuel for muscles during slow and medium pace work while glycogen is the only source of energy a muscle can use during sprints and strenuous exercise. Once a horse runs out of glycogen its muscles fatigue and the horse will slow down and lose the ability to perform at the level it is capable of. Feeding oil in diets provides a source of fatty acids for muscles to burn during the warm up and slower phases of a competition, meaning muscles are able to conserve valuable glycogen and avoid fatigue. ‘Problem horses’ and particularly those that tie up or get excited and nervous on high grain diets will often benefit from rations that provide a portion of the dietary energy from oils. It is thought that the positive effects seen in these horses on high oil diets is due more to the reduction in grain intake as opposed to the addition of oil, but using oil in the diet allows you to reduce grain intake without compromising energy intake and performance. Essential Fatty Acid Content: Horses need omega 3 and omega 6 fatty acids in their diet. Grains are naturally high in Omega 6, so for horses on a high grain diet, it is preferable to choose an oil with some omega 3 content. The table below shows the amount of omega 3 and omega 6 in some commonly used oils. Linseed and canola oil contains the highest omega 3 fatty acid content of the natural vegetable oils. 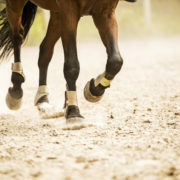 Palatability: Some linseed oils and fish oil including cod liver oil are notoriously unpalatable for horses, so while these oils are useful for providing omega 3 fatty acids, they can’t be fed in large amounts as most horses simply won’t eat them. Processing Method: Oil is extracted from oilseeds in two main ways; cold pressing where oil is squeezed out of seeds, often in a water cooled environment to keep the oil at less than 60C; and solvent extraction where a solvent like hexane is added to extract oil from seeds. The oil is then heated to remove the hexane. Cold pressed oils tend to be higher in quality as more of their essential fatty acids and natural antioxidants are left intact in comparison to solvent extracted oils. Horses need time to adapt to digesting and metabolising oils. Oils should always be introduced into a diet slowly, starting with ¼ cup of oil per day and increasing this by ¼ cup every 5 days until you reach the full amount you want to feed. Introducing oil into a diet too quickly can result in soft manure and reduced fibre fermentation in the hindgut. It will take a minimum of 3 weeks before a horse starts to really benefit from the oil in its diet and it could take up to 3 months before the full benefits of oil are realised. How much can you feed? Horses can be fed up to 20% of their total energy intake as oil, which in real terms means just over 3 cups of oil per day for a 500 kg horse in full work. While this level of oil is useful for horses that tie up, very few horses are fed this much oil per day. Feeding between 1 and 2 cups of oil per day is enough to give horses the benefits discussed above without making diets messy, unpalatable or unnecessarily expensive. Oils are ‘good stuff’ for working horses. They reduce reliance on grains, make the amount of feed a horse needs to eat smaller, keep horses cooler, allow horses to conserve muscle fuel for sprinting, give horses that tie up a safer and more effective source of energy and provide essential fatty acids in the diet. For the best results, introduce oils slowly into the diet and select oils based on the following: their omega fatty acid content with oils containing some omega 3 fatty acids preferred; palatability, be aware that some oils including linseed and fish oils can be unpalatable; and method of processing, with cold pressed oils preferred over solvent extracted oils. Dr. Nerida Richards is FeedXL’s resident equine nutrition specialist. With a degree in Rural Science, a doctorate degree in equine nutrition and nearly 20 years of full time, on the ground experience in feeding all types of horses Nerida is able to help FeedXL members solve any problem they may come up against with feeding their horses. To learn more about Nerida and to ‘meet’ the rest of the FeedXL team, check out our About Us page here. This newsletter by Dr. Nerida Richards was originally posted to the FeedXL user forums for FeedXL subscribers in April, 2014. If you would like to be among the first to receive our newsletters then please consider becoming a FeedXL member or subscribing to our email list. https://feedxl.com/wp-content/uploads/2014/04/iStock_000010816729Small.jpg 547 877 Dr Nerida Richards https://feedxl.com/wp-content/uploads/2017/08/FeedXL-header-logo-300W.png Dr Nerida Richards2014-04-16 11:13:452019-03-02 06:29:43Oil for Horses: Good or Bad? Does Your Horse Need Electrolytes? As a horse exercises its muscles generate heat. To prevent its body from dangerously overheating, the horse sweats to allow evaporative cooling to dissipate the heat being produced. As a horse sweats, water and electrolytes, including sodium, chloride, potassium, magnesium and calcium are lost from the body. For effective sweating to occur, the horse must be well hydrated and have an ample supply of electrolytes in its body. The electrolytes and water lost through sweating must be replaced following exercise to prevent electrolyte depletion and dehydration. This newsletter will look at what electrolytes are and why they are important, how much ‘electrolyte’ a horse needs, where horses get electrolytes from in the diet and when to use an electrolyte supplement. Very simply, electrolytes are minerals, which, when present in a watery solution like body fluids, become positively or negatively charged particles that have the ability to conduct electricity. Electrolytes maintain fluid balance and circulatory function, facilitate muscle contractions, trigger nerve functions and maintain the body’s acid-base balance. The most important electrolyte minerals are sodium, chloride, potassium, magnesium and calcium. What happens if a horse becomes electrolyte deficient? Electrolyte deficiencies are associated with fatigue, muscle weakness, lethargy and reduced feed and water intakes, resulting in weight loss and dehydration. In addition, electrolyte deficient horses may experience reduced sweating, which can result in hyperthermia (over-heating) and compromised performance. Studies in England have also linked electrolyte deficiencies to the incidence of recurring bouts of tying-up (Harris et al. 1992). Please Note: severe electrolyte deficiency can result in complete exhaustion, colic, synchronous diaphragmatic flutter (commonly known as the ‘thumps’), collapse and death if not treated. Severe electrolyte deficiencies are a veterinary emergency requiring IV fluids, electrolytes and specialist care so please call your vet immediately if you suspect your horse is acutely dehydrated and electrolyte deficient. How much ‘electrolyte’ does a horse need? All horses have a small daily requirement for electrolytes to replace the obligatory losses from the body in the urine and faeces. This requirement is termed a horse’s ‘maintenance requirement’ and is reflected in FeedXL’s recommended daily intakes for horses not in work. The amount a horse sweats, and therefore its electrolyte requirement, will be determined by the amount of work it is doing, the intensity of work it is performing and the climatic conditions in which the horse lives and works. Individual horses also vary considerably in their tendency to sweat. As an indication, in a moderate climate, a racing thoroughbred will lose between 5 and 10 litres of sweat during a daily workout and an endurance horse will excrete between 5 and 10 litres of sweat per hour when travelling between 12 and 18 km/hour. Sweat losses of up to 15 litres/hour can occur during high intensity exercise where horses are travelling at between 30 – 35 km/hour. FeedXL calculates your horse’s electrolyte requirements for you based on a sweat loss of 1.6 L per day for horses in light work, 4.4 L per day for horses in moderate work, 6.7 L per day for horses in moderately heavy work and 8.9 L per day for horses in heavy work. 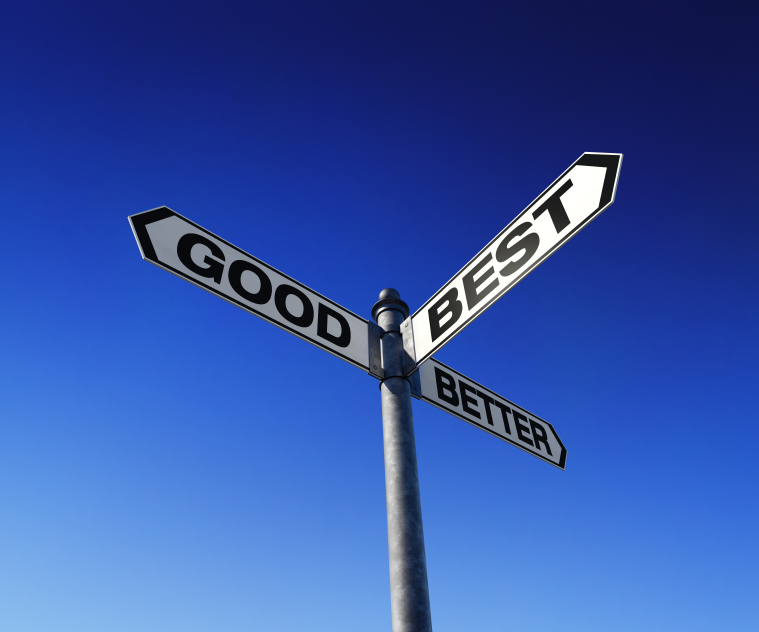 How does climate affect requirements? Hot and particularly hot and humid climates increase a horse’s need for electrolytes as horses will sweat more under these conditions. 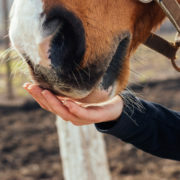 As a general guide, if the temperature is 30C (86F) supply 140% of your horse’s recommended daily intake (RDI) calculated by FeedXL for sodium, potassium and chloride . If the temperature is 35C (95F), supply 170% of your horse’s calculated requirement for these minerals and if the temperature is 40C (104F) or over you should supply 200% of their requirements. Also be sure to have a salt lick available at all times. Where do electrolytes come from? Pastures and forages are almost always a rich source of potassium and are commonly a good source of magnesium. However they tend to contain variable and often unknown concentrations of chloride and typically low concentrations of sodium. Common table salt contains 39% sodium and 61% chloride and is frequently used as a readily available, palatable and cheap source of these electrolytes in a horse’s diet. Potassium chloride (50% potassium, 47% chloride) can be used to supply additional potassium and chloride where required and magnesium oxide is a readily available and cost effective source of magnesium where additional magnesium is needed. 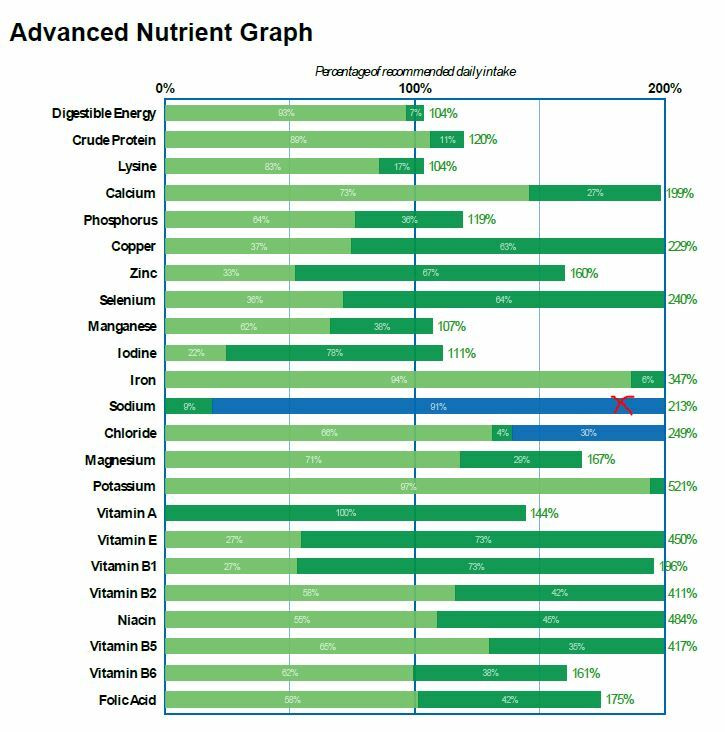 Grains contain only very small amounts of all the electrolyte minerals and it is high grain diets that are most commonly ‘electrolyte deficient’. When should you feed an electrolyte supplement? In many situations horses can get enough electrolyte minerals from a forage based diet that has plain table salt added for additional sodium and chloride. Some horses on high grain/low forage diets may benefit from an electrolyte supplement that contains potassium or need potassium chloride added to their feeds. On a day to day basis though, most horses won’t need a commercial electrolyte supplement. Commercial electrolyte supplements are however very handy in situations where your horse is away from home, not grazing or eating as much hay as he normally would and/or working a lot harder or longer and sweating more than usual. Well formulated supplements (ones that contain the same proportion of electrolytes as those found in equine sweat) can be used in these situations to quickly replace electrolytes lost in sweat. Where prolonged exercise occurs (for example endurance riding or long days of stockwork or trail riding) it may be necessary to provide some electrolytes during the period of exercise. Well formulated electrolyte supplements will provide enough electrolyte minerals in a 60 gram dose to replace the salts lost in 5 litres of sweat. There is debate over how much electrolyte replacer you should give to working horses with no firm recommendations available given it does depend so much on the climate, intensity of work and the horse as an individual. If a horse is sweating consistently over a long period of time AND will have access to water frequently you can give 60 grams of electrolyte every hour to two hours. If water is not available on a frequent basis give 60 grams of electrolyte when you know the horse will have access to water and can have a good drink. Don’t give more than 60 grams per dose as you may overload the horses ability to absorb the salts you give. Well formulated electrolyte supplements will contain 20 – 25% sodium, 43 – 48% chloride, 10 – 12% potassium and smaller amounts of magnesium and calcium (normally 1 to 2%). These higher quality products will also have less than 20% glucose or other base or filler. Always make sure your horse has access to water after being given electrolytes as they will get thirsty and need to be able to drink. Failure to provide water will result in dehydration because the salts will pull water out of the body and into the gut. If it is possible, wait for your horse to have a drink of water before giving it electrolytes. Never give electrolytes to an already dehydrated horse that isn’t drinking as you will worsen the dehydration. Call your vet in these situations. Don’t add electrolyte supplements to a fussy horse’s feed as chances are it won’t eat them. Instead mix the electrolyte with apple sauce and give it over the tongue (beware they will spit it all over you!). During endurance rides where feed intake is also important, allow your horse to eat before giving him electrolytes as a paste as it will often stop a horse from eating for a little while which may affect your gut noise scores. Always have a salt lick available to allow your horse access to extra sodium and chloride at any time. If you want to use an electrolyte to help make your horse drink when away from home try it out at home to see if it works – if you dose your horse with electrolytes and he doesn’t drink he will actually end up more dehydrated than when you started. To increase water intake, offer slightly salty water to your horse as its first drink after exercise. Research has shown (Schott et al 2003) that horses who drink slightly salty water (0.9% salt, 90 grams of salt per 10 litres of water) initially will drink more water and rehydrate themselves faster after exercise than horse who drink plain water as their first drink. You will likely need to train your horses to drink the salty water, a touch of molasses might help. This newsletter by Dr. Nerida Richards was originally posted to the FeedXL user forums for FeedXL subscribers in January, 2014. If you would like to be among the first to receive our newsletters then please consider becoming a FeedXL member or subscribing to our email list. https://feedxl.com/wp-content/uploads/2014/01/iStock_000012676792Small.jpg 632 759 Dr Nerida Richards https://feedxl.com/wp-content/uploads/2017/08/FeedXL-header-logo-300W.png Dr Nerida Richards2014-01-16 10:30:322019-01-09 09:44:17Does Your Horse Need Electrolytes?